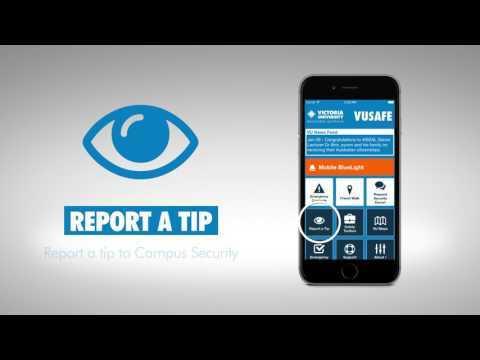 VUSafe is the free, official mobile safety app of Victoria University. The app is packed with safety information, tools and features to keep you safe on campus. VUSafe is free to download. VUSafe - safety, security and support services at your fingertips. In an emergency press the Emergency Alert to call Campus Security and allow them to view your location on a map in real-time. Receive push notifications alerting you to safety and emergency information on campus, including building or campus evacuations. Immediately contact emergency services with the push of a button. On campus you can contact Campus Security and request first aid assistance. Off campus you can contact Emergency Services 000 (triple zero). Have a friend virtually watch over you as you walk. Tap the button and select a contact, they’ll receive a message with a link to view a map and track your location. Pick your destination, and start walking. If you need help just hit a button to notify your friend and start an emergency call. When you get to your destination safely, just tap the button to end the call. Send a request to Campus Security officers, who can walk you to and from buildings, public transport or to your vehicle on campus. You can make a call or book using the enquiry form in advance. Report a concern to Campus Security or Safer Community. You take a photo or video and send it directly through the app, call Campus Security or report online. The toolbox has the VU Shuttle Bus timetables, as well as safety tools, including a flashlight and safety notification history. Safer Community - support and assistance for those who experience or witness concerning behaviour. Counselling service - confidential counselling support for students and staff. Accessibility service - confidential support and assistance to students with a disability or medical condition that impacts on their studies. Student welfare - confidential support and assistance to students, including financial, housing and legal advice. Academic support - one-on-one academic assistance, as well as group programs and workshops. Student advocacy - student complaint support and resolution. Women's Information and Referral Exchange. Visit our campus page to view maps for all our campuses. Be prepared to respond to an emergency situation on campus. Emergency plans tell you what to do and when, for example when you hear an evacuation alarm. These plans are available offline, so even if you don't have access to the internet when you need them, you can still view the emergency plans. VUSafe uses beacon technology to locate your device using GPS, WiFi and Cellular services. Location services must be enabled on your phone to send your location to Security Services using the Mobile BlueLight (emergency alarm) and live tracking using the Friend Walk. VUSafe uses high-speed push messaging through WiFi and Cellular networks to send safety alerts to your phone. Notification services must be enabled on your phone to receive the notifications. If you’re connected to a network you’ll get a notification even when the app is not running. When should I use the Mobile BlueLight? You should trigger the Mobile BlueLight to send an emergency notification if you feel unsafe, if you or someone else has been threatened, assaulted or robbed. When should I report a tip? You should report a tip when you see any security incidents or suspicious activity on campus or in carparks. You can use the options to send a photo or video tip, as well as an email.